Karen reached out to HAT, hoping for an opportunity to train and travel on the WTA circuit with the expert coaching team. You see Karen does not come from a family of professional athletes or parents who are well to do. They are an every day family, with an extraordinary daughter; fighting her way to the top of the game, often facing what seem to be insurmountable obstacles. Traveling the world every week playing tournaments in not so glamorous locations, often alone, with enormous pressures from home and from self, can be overwhelming. Breaking through as a professional tennis player is extremely difficult. It certainly demands skill, talent and dedication; however, it also requires a tremendous amount of emotional and financial support. Becoming a top-ranked tennis player does not happen automatically. “I didn’t just wake up one day thinking, ‘Wow, I want to be a tennis player!’ says Karen, “It all came gradually. I started playing when I was six on a vacation in Romania, and got really into it and practiced a lot. When I came home (to Denmark), I was playing quite well, started winning a lot and kept practicing – people and coaches started noticing me. Karen credits her involvement with HAT for much of her success both on and off the court. “Those involved with HAT are ambitious and talented. The organization provides a nurturing environment so that you can take your tennis to the next level. 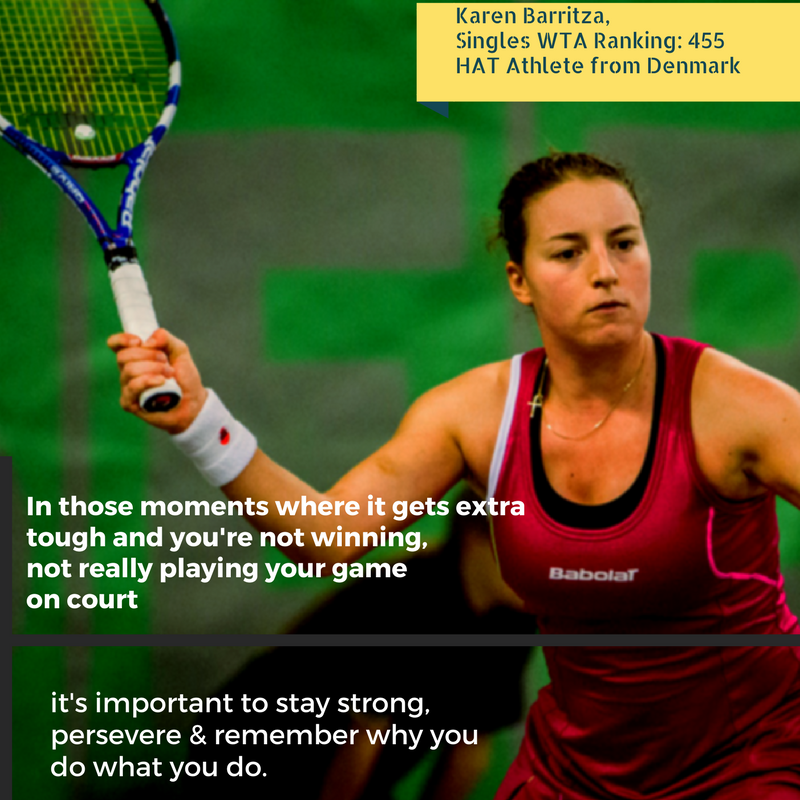 I have learned a lot and have had a lot of experiences that I feel I can take with me ‘till later in life.” Karen’s goal is to be in the Top 100 WTA singles and to play Grand Slam events. Thank you for your lovely comments. Please do follow us on Twitter, Facebook, Tumblr and all other major Social Media Website and share your stories with us at #HATFundstories on any social media.